Abide under a shadow? You’ve got to be kidding. Shadows aren’t safe, are they? Yet David says that those who dwell in the secret place, abide under a Shadow. Let’s see why David thinks this Shadow is a great place. The word “under” means just that, but the word shadow has some interesting twists. This Shadow is more than a shelter. It is more than just a roof on poles with open sides to keep the sun or rain off. It is a hiding place that you can enter and no longer be visible to the outside world. 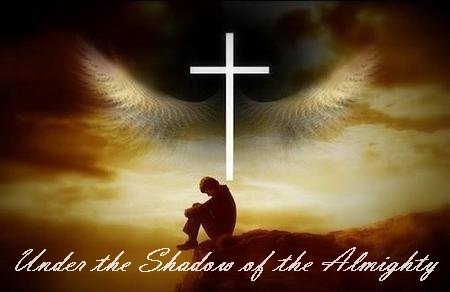 You can disappear in this shadowing place of the Almighty. Is there more to it? Let’s look at the Hebrew and dig a little deeper. 6738. A masculine noun meaning a shade, a shadow. This word is frequently used as a symbol for protection or refuge. To be UNDER THE SHADOW is to be in humility and righteousness, under the blood of Messiah, with His authority as our covering and His instruction for our guide. This is much more than a beach umbrella. Graham Cooke tells of a dream he had where he was being hotly pursued by a group of thugs. They were gaining on him but just when he thought he was toast, he looked up only to see them race past him, as if he weren’t there. He found himself encapsulated in a chamber that allowed him to see out but remain unseen by those on the outside. Our secret place in Jesus is just such a place. No foe can or will enter because the Almighty God, Ruler of heaven and earth, Sustainer of all that is or was or will be, the Captain of the hosts of heaven and Lord over every principality and power is overshadowing us. They wouldn’t dare enter, plus when we are IN Him, they are so blinded by His presence that we are unseen. Let’s finish out this verse. Abide under the shadow of the ‘Almighty.’ That’s right, it isn’t just any shadow. It is the shadow of the Almighty. Almighty is another one of those words that gets lost in our contemporary world of super heroes and oversized everything. Therefore, by definition, to the one who dwells in the secret place there is the promise that the shadow of the Almighty will cover them, hide them and provide for them completely. 7706. šadday: A masculine noun and name for God meaning Shaddai, Almighty. The word occurs only forty-eight times in the Hebrew Bible, thirty-one times in the book of Job. This is a name for the Lord—the Old Testament people of faith referring to Him as El Shaddai, God Almighty. The term is found in the passages that report God’s promises of fertility, land, and abundance to them, indicating that He, the Almighty, could fulfill His promises (Gen 17:1; 28:3; 35:11). When we dwell in the secret place we abide under Holy Spirit fire of God, who consumes our enemies at the door, with His overseeing right hand of power. This shadow provides security and provision unmatched by anything this world has to offer. When we choose to move into the secret place of the Most High, we become acquainted with the One Who is the Source of every breath we breathe. We soon discover that only IN HIM do we live and move and have our being. Outside of Him and complete surrender to Him, we are functioning on our own power, which is just plain stupid. We have the source of all power, all resources, all that is good living in us. Why would we in good conscience turn to any other source? Father, how lovely is Your dwelling place. Help me to put aside every other thing that pulls for my affection or attention and settle into the secret place with You. Help me to rest under the shadow of the Almighty, with complete confidence that You are able to overcome all the enemies of my soul. There is no place I’d rather be than hidden in you. ← 4-Are You Hiding or Abiding?